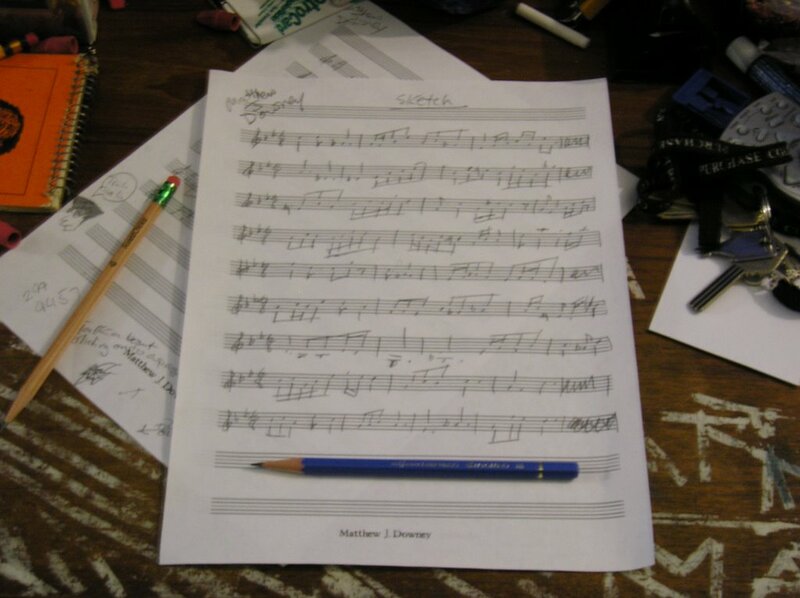 I received the attached photo and note from Matt Downey demonstrating how he’s using our Palomino pencils for his musical efforts. Yeah, I see it there in the corner and am glad to spot a ForestChoice pencil as well. Thanks for sharing and keep on creating. California Republic has now introduced triangular shaped pencils in our Golden Bear and Prospector product ranges. 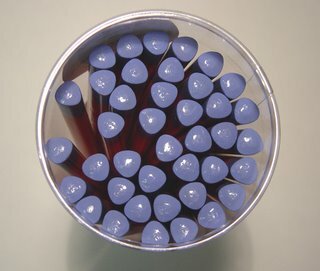 These are the first of what we hope may become an expanded range of triangular pencils over time. The Prospector Trianguler HB 40 count tube is available in our Prospector Green color. 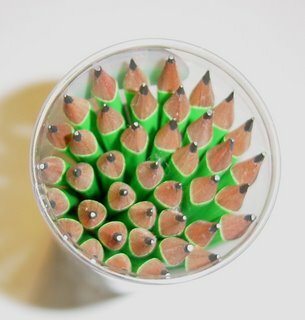 This pencil is tipped with our standard round white eraser as is the green Prospector pencil in our standard hexagonal shape. On future option under consideration is a natural finish version without eraser, although we have no definite time schedule to add any new triagualr versions at anytime soon. 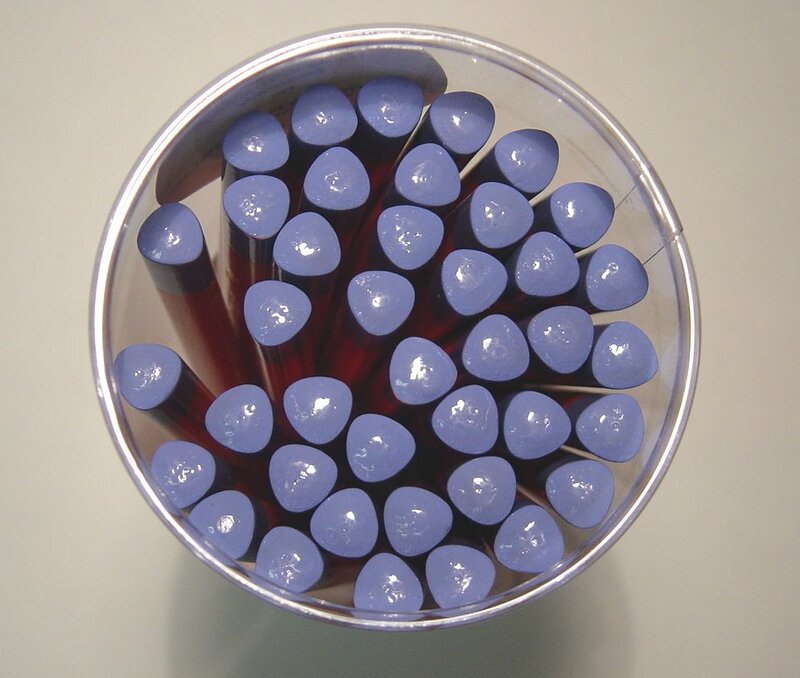 The Golden Bear Triangular HB 40 count tube features our orange and blue color combination in an attractive end dip. No eraser at this point though we will consider the future addition of a blue triangular shaped eraser version for the down the road. Sorry to say we have no immediate plans to offer a triangular version of the Palomino pencil. We do have a few auction items with special savings chances on a few items right now including this, this & this. We also have a Summer Color Splash pencil promotion going on as well as the extension of our Soccer Mania promotion. So if you haven’t visited our Pencil World Creativity Store lately drop on by with any of these links. 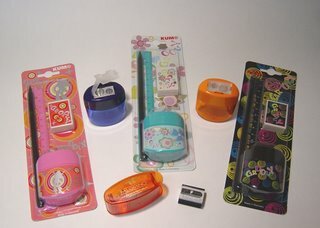 We have several long awaited new arrivals this week to expand our range of KUM sharpeners at Pencil World Creativity Store. 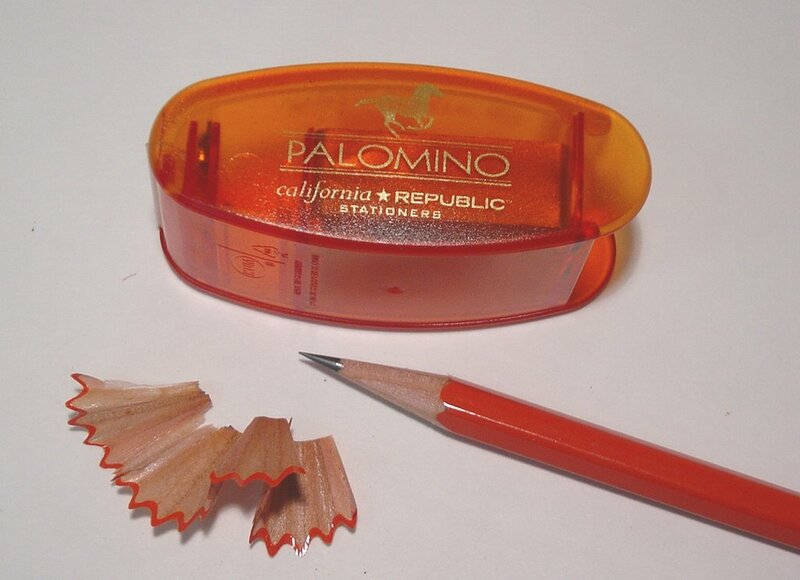 First, is our special edition Palomino Long Point Sharpener. This is a premium “Automatic” long point sharpener from KUM that features a two step process to acheiving a perfect point. The first step sharpens just the wood leaving the graphite core mostly untouched for step two; sharpening the graphite core to a fine even point. Prior to being exposed to this two step sharpener I was personally a devotee of the KUM metal wedge sharpeners, which I still enjoy for their simplicity, and clean short points when I’m using a Golden Bear or Prospector. However now I won’t touch my Palominos with anything but the Long Point sharpener. This provides a fine, crisp point that lasts longer between sharpening than the wedge point. When I was first introduced to this sharpener back at the Paperworld fair in Frankfurt by KUM owner-President Fritz Luettgens I knew I had to pair this one up with our Palomino pencils. The group at KUM was great to work with creating a series of color variations until we got just what we wanted, a nice translucent orange with our gold California Republic Palomino imprint on one side. Each sharpener comes with two spare blades and a cardboard case with operating instructions on the two step sharpening process. Three other new KUM sharpener listings have also been added. The Softie Grip Magnesium II takes the one hole Magnesium sharpener and adds the ergonimic cushioning of a spongy grip to two sides. This feature provides a unique comfortable feel during sharpening. For another new container sharpener we’ve added the “Oval-Office-Large SOFTIE®-LINES” in blue and orange. This larger container sharpening includes the Magnesium two hole sharpener which can be removed for replacement. The softie lines feature provides a non-slip grip for handling the sharpener, but not the same cushioning effect of the Softie Grip. Next is a unique new combination product ensemble from KUM, the Groovy Blister Card Set. The Groovy set comes in three fun design styles and each set includes a decorates large Oval Office style sharpener with an eraser, 17cm ruler (sorry only metric measurement was available) and a unique graphite pencil produced from wood which has been stained black throughout. These sets will make great party favors or simply a nice gifts particuylary for girls in the 7 to 12 year old age group. In celebration of the Germany 2006 World Cup we’ve also added a limited time Soccer Mania Promotion. Buy 5 10-packs of Spangle Soccer pencils and recieve a free KUM soccer sharpener. We have a limited group of seven soccer sharpeners and one of these features the Germany 2006 design so it’s first come first serve as to which sharpener you will receive. If you wish you can substitute any of our other Spangle 10 pack decorated pencil items if you don’t want all soccer pencils, just be sure to buy at least 5 packs total in one purchase and we’ll send the sharpener along. Comming Soon: Two new listings for Golden Bear and Prospector triangular pencils.